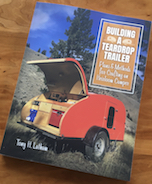 Teardrops n Tiny Travel Trailers • View topic - Bikes on a tongue box... Thoughts? Re: Bikes on a tongue box... Thoughts? tony.latham wrote: If I ever build another teardrop, I think I'll kinda copy what Cozy Cruiser does for their bike racks. glad to hear another member knows about Cozy Cruiser! They are building a Canned Ham for me - the first one they have attempted. Wonderful people and I am thrilled with the build. I stole that pic off the 'net after seeing one in Utah. You'll have to share some pics of your little road cabin when you get it.